Good morning, and welcome back to another inspiration hop! Today we are showcasing the Rustic Autumn and Something Good in Every Day sets. 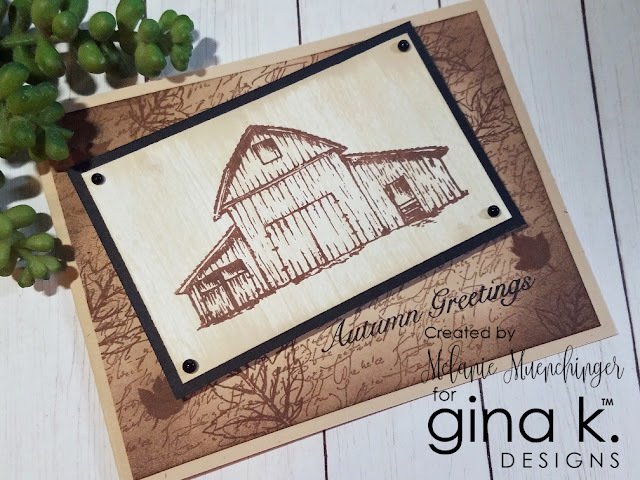 We are giving away a $50 gift certificate again today to the Gina K. Designs store, so we hope you will leave comments along the way through, each and every comment is a chance to win! Check the StampTV forum where winners will be announced a few days after the hops. Good luck! First up, Rustic Autumn! I stamped this lovely barn in Dark Chocolate onto white cardstock, and then dragged the Sandy Beach pad downward all across it several times to create the wood grain! Even in real life, it tricks me, looks so real! I mounted it on Black cardstock and added some Jet Black Nuvo Drops because I'm out of all my masculine looking little brads! 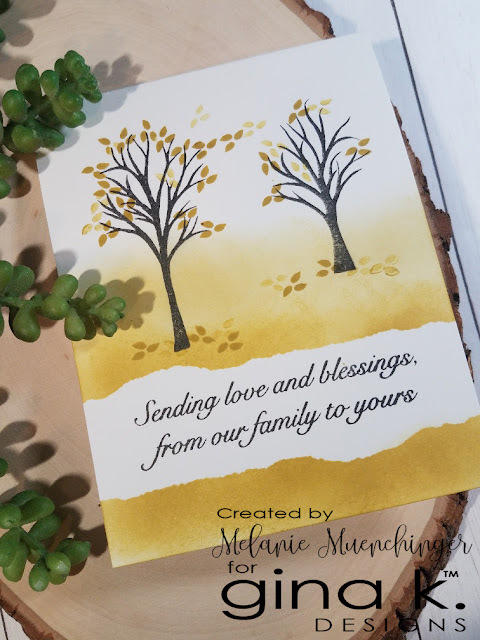 The background mat is made from stamping the new Elegant Script in Dark Chocolate on White, and then sponging and and adding a few of the gorgeous line art and bold leaves in the set. Greeting is Jet Black Amalgam, and base is Pure Luxury Sandy Beach. For this card, I tore a piece of scratch paper to mask off a section for the greeting and sponged with Prickly Pear. After removing, I worked my way up so that it would fade out into the distance like a field. I stamped the greeting and trees in Jet Black Amalgam, and then added the leaves in Prickly Pear. I love one tree sending leaves to the other with this sentiment! Next up, Lisa Hetrick's Something Good in Every Day! I showed one card with the wood yesterday, and today I'm sharing a simple Christmas design. I stamped this gorgeous slice of wood in GKD Sandy Beach on Pure Luxury White and then mounted in on the coordinating Sandy Beach cardstock. The branch is stamped and stamped off in Fresh Asparagus. The berries and cool offset rectangle frame are stamped in GKD Red Velvet. 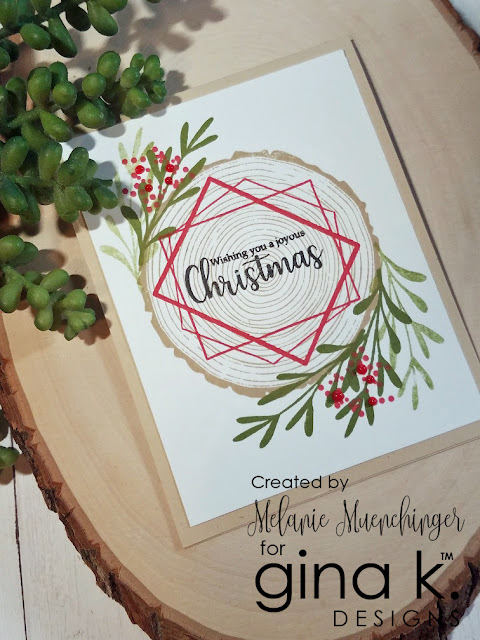 This looks like a perfect modern country Christmas design so I chose a greeting from Gina's Fruit of the Season kit (stamped in Jet Black Amalgam). Let's see more from the rest of our team! Oooh, love that rustic barn card! Beautiful cards!!! Each of the cards are beautiful. I was excited to see how the tree slice would look on a card, and 8 love it. Than’ you for sharing your time and talents with us. Great cards. I love old barns! Super cards. I love the rustic barn with the wood grain look. The script with the leaves makes a perfect background. The rustic barn card is fabulous, and I love the look of the wood slice in a Christmas card. Beautiful cards! Great cards! Love the rustic feel! love how you combined some of these new stamps sets on your cards - love the script background with the leaves on the first card! Very pretty cards...all keepers for sure. Thank you for your creations. Savoring all this beauty. Thank you for these great cards. I'm madly in love with that barn! I have so many horsey people in my life that would love a card with a big rustic barn on it! Loving the barn! Your cards are great. Thanks for these designs, you make it look simple and elegant! Great job , beautiful ! Love the barn and all the others too ! I want to dub you the Queen of Masking. You are so talented. Love all of these cards and everything you create. Gorgeous cards! I like how you turned the wood into a Christmas card. I think my head is going to explode! So many great cards! idea and design of that card. Love the barn card. So tranquil. TFS! Great cards! I think I love the simple Christmas design the best. Great cards. Very inspiring. I love the second card. All of your cards are wonderful, but Oh, that barn! Love it. Beautiful cards! Love the barn! Thanks for sharing! The background of the barn card is wonderful for this setting, and the wood slap card is very well done. Great job. What a perfect Christmas card! Love the simple barn, too. I love the last card with red frame. I love the cards you made with these fabulous stamp sets. Your cards are amazing. The first one makes me nostalgic -- it reminds me of the barn on my late grandparents' farm. I am enjoying the uniqueness of each vlogger. You have the qheels spinning in my brain. Your cards always please. I enjoy your videos and your inspiration. Awesome cards, I love the unusual elements on the Christmas card! Melanie, love your cards, but especially the Christmas card made with Lisa's new set. I think I'm going to have to CAS that one this year. Thanks so much for the inspiration! All three of your cards are absolutely beautiful, but I love the first one with that brown barn. love the ripped paper look! Beautiful cards and barn scene. Love the stamp sets and your cards are beautiful. Beautiful cards! I love how you designed your barn card. Beautiful Cards! You're so talented. You have had a hard week and yet you still put out these beautiful cards! Your barn card is 😱 wowza! As always, your cards are beautiful and inspiring! Lovey cards! Thanks for the inspiration! I do especially love that first card with the barn...the layered stamps on the background is awesome! Melanie, Wow what beautiful cards! The barn card is so dramatic with its monochromatic feel. Love them all, thanks. Melanie, love your cards, especially the barn one! Very rustic looking, great for a man or a woman! Your cards are beautiful! I love the versatility in this release! beautiful cards! love how you did the sentiment in the fall card! Perfectly lovely cards! Gorgeous designs and fabulous inspiration. All your cards are great. I love the background on the barn stamp! Thanks for the inspiration with these beautiful cards! Beautiful cards! So inspiring to see so many different designs for the stamps! These are all very nicely done. Very pretty. Awesome and inspiring, thanks for sharing. The unique and creative touches you use to create your cards always inspire me to push my own attempts at thinking outside the box. I love all your stamp sets and the new open book set is beautiful and there are so many things you can do with it.